For the composer, see John Adams (composer). Adams' term as Vice President is sometimes listed as starting on either March 4 or April 6. March 4 is the official start of the first vice presidential term. April 6 is the date on which Congress counted the electoral votes and certified a Vice President. April 21 is the date on which Adams began presiding over the Senate. 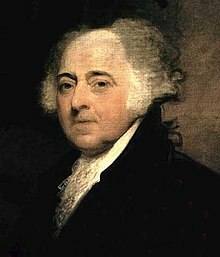 John Adams, Jr. (October 30, 1735 – July 4, 1826) was the second President of the United States (1797–1801), and father of the sixth President, John Quincy Adams. He was also the first Vice President of the United States (1789–1797). Adams was born in Braintree, Massachusetts. He was the son of Lt. Col. John Adams, Sr. (1691-1761) and Susanna Boylston (1708-1797). He went to Harvard College. He married Abigail Adams in 1764. Adams wanted the Thirteen Colonies to be free from Great Britain. However, Adams was fair and thought every person should be treated fairly. Even though he did not want British soldiers in Boston, he was the lawyer who defended the British soldiers who were involved in the Boston Massacre. Adams was a representative from Massachusetts during the Second Continental Congress. He helped Thomas Jefferson write the United States Declaration of Independence. During the American Revolutionary War, Adams helped make peace with Great Britain. He served in France, the Netherlands and England as an ambassador in the 1780s. Adams was the first vice president under George Washington. After Washington chose not to run again, Adams won the 1796 election. Adams is thought to have been the first president to belong to a political party, but like George Washington, he thought himself above any particular party. He ran for president on the Federalist ticket. He beat Thomas Jefferson of the Democratic-Republican Party. President candidates and vice president candidates did not run together like they do today. Since Jefferson got the second highest number of votes, he became vice president. During his term, he resolved a conflict against France peacefully. He also passed the Alien and Sedition Acts which made it illegal to say bad things about the government. Many people did not like those acts because they felt it took away their freedom of speech. Adams was not re-elected president and lost to Thomas Jefferson. The Federalist Party was not as popular as it was when Adams was elected. One of his last acts as president was to make John Marshall the Chief Justice of the United States. This made sure that the Federalist Party would still be important. Of the first five U.S. presidents, Adams was the only one who did not own slaves. He was also the only one to be from New England. Adams died on July 4, 1826 of heart failure. This was the same day that Thomas Jefferson died, and was also exactly 50 years after the Declaration of Independence was signed in 1776. ↑ "The religion of John Adams, second U.S. President". Adherents.com. Retrieved 2012-05-15. ↑ "Key Figures in the Boston Massacre Trial". law.umkc.edu. Retrieved November 16, 2010. This page was last changed on 3 April 2019, at 02:11.